Fabric upholstery is made of 100% post-consumer recycled plastic bottles and is solution dyed in an eco-friendly process. Cushioned seat and back with side and lumbar boosters. 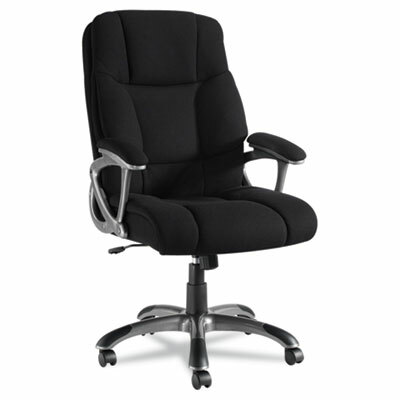 Padded armrests offer comfort and support. Chair could contribute to the individual prerequisites and credits of LEED. It's easy being green! Fabric upholstery is made of 100% post-consumer recycled plastic bottles and is solution dyed in an eco-friendly process. Cushioned seat and back with side and lumbar boosters for sofa-like comfort. Padded armrests offer all-day support. Five-star base with casters for easy mobility. Chair could contribute to the individual prerequisites and credits of LEED. Arm Height From Seat 8 3/4"
Distance Between Arms 18 1/2"
Disclaimer Statement(s) Casters supplied with this chair are not suitable for all floor types.